Seems Batman is going off on a top secret mission for a while, leaving the junior member of the firm to fend for himself. Soon after, Robin encounters a mysterious little dude going by the name of Ant-Man. Is he a good guy, or a bad guy? What's his secret? And for heaven's sake, didn't ANYBODY at DC ever think to stop for a minute and take a peek at what their competitor's were doing? Would it've killed 'em to pick up a copy of TALES TO ASTONISH occasionally? THEN maybe they would've learned the REAL secret of Ant-Man--that his name was Hank Pym, and he worked for the competition! It was enough to bring the now-prophetic title of the story to it's grim fruition along the top of page 6, as the valiant Robin leaps in front of a boulder tossed by the pink rock monster in a last volley as he himself is sliding off the side of a cliff to his (presumed) doom. 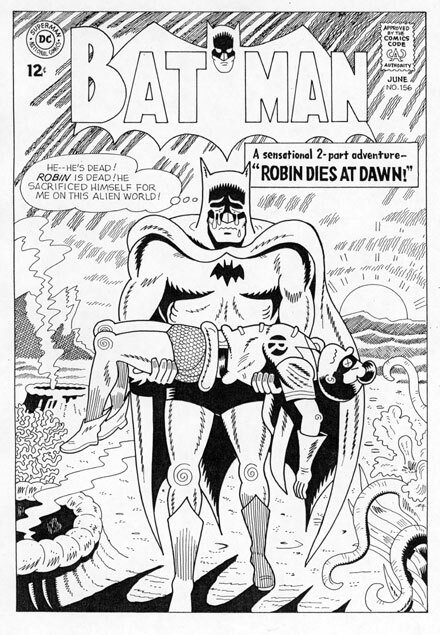 Hit flush by the hurled missile of death in an awkwardly drawn panel, the bystanding Batman soon realizes the sad truth, and by that page's last panel, has already buried his now-former partner under--irony, anyone?--a large pile of rocks. This is where all that extra emotion comes in, kiddies, especially as ol' Bats starts flailing about on the very next page when he's suddenly confronted by yet another big monster--this one's red--shouting, "Let it come! I don't want to live! It's my fault Robin died! I don't want to live..."
Chapter two? Well, essentially that deals with a series of flashbacks that wrest control of the Darknight Detective at the most inopportune of times, resulting in his effectiveness patrolling the rooftops of Gotham reaching an all-time low. Tossing and turning violently in his sleep, needing the company of Ace the Bat-Hound just to make it through the night, clearly, the man needs a break before he even THINKS about donning the mask and cape to hit the streets again. And that indeed was the plan--until word came in that the deadly consortium of thieves known as the Gorilla Gang was on the loose in Gotham City!! So anyway, with our prime protagonist's psyche at it's most precarious, an opportunity presents itself wherein the Gorilla Gang gleefully holds the final fate of the bound Boy Wonder in their hairy little palms, with his ultimate demise scheduled for--yes!--dawn!! Our hero, at this, his shakiest, least confident moment in his entire storied career, realizes the tremendous stakes at play, and wonders--good golly gosh, can he do it? Can he get it together in time and rescue his ward, rescue him in a way he was unable to while trapped in the alien landscape that was, in fact, his mind? And speaking of the elusive Mr. Kane, while he'd successfully hired a series of artists to ghost the work he'd continuously signed his name to, effort free, almost from the feature's very beginning, the work of Moldoff was by far the least inspired yet to see print under the omnipresent boxed--and brazen--Kane signature. Now, I realize there are quite a few folks out there who look upon his tenure quite fondly, and I'm reluctant to offend either them or the artist himself, still active at conventions to this very day as best I can tell, but c'mon--that stuff was AWFUL. Just my opinion, mind you, but the amorphous pliability of the stiffly posed characters combined with the thoroughly unconvincing artistic environments that they went about their insipid escapades in, well, SOMETHING had to be done!! Batman needed a freshening, an updating of some sort. A technical note about my re-do: generally, I keep solid blacks solid, thick line-weights thick and so on and so forth. 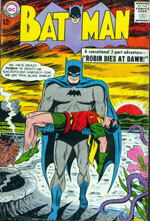 However, I felt that by "dimming down" the background elements, it would help bring the iconic image of Batman carrying his fallen partner to the foreground with better effect. And yes, given my lack of enthusiasm for Mr. Moldoff's work, this was indeed a commission (Hi, Arthur! ), and not a cover I chose to reinterpret my ownself! But in it's own way, it IS a classic, and it provides me with a springboard to investigate the FURTHER changes brought upon our two crimebusters.